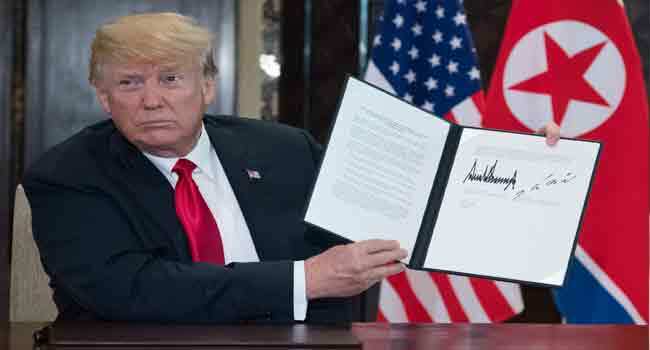 US President Donald Trump on Thursday again signalled optimism about efforts to end the nuclear standoff with North Korea, as he took the extraordinary diplomatic step of tweeting out a letter from Kim Jong Un. The four-paragraph letter — an upbeat missive in which Kim voices hope in a “new future” and speaks of his “invariable trust” in Trump — is dated July 6, the day Secretary of State Mike Pompeo landed in North Korea for what turned out to be acrimonious talks with Kim’s regime. Pompeo travelled to Pyongyang for two days last week in a bid to flesh out denuclearization commitments made during last month’s historic summit. Pompeo has insisted that a raft of tough economic sanctions imposed on North Korea would remain in place until “final, fully verified denuclearization” occurs. And even as Trump released Kim’s note, the US was asking the UN Security Council to punish North Korea after finding that Pyongyang had violated restrictions on refined oil imports. According to documents seen by AFP, the US sent a report to the UN sanctions committee that estimated at least 759,793 barrels of oil products had been delivered to North Korea between January 1 and May 30, well above the annual quota set at 500,000 barrels under a sanctions resolution adopted in December. The illegal supplies were provided through ship-to-ship transfers at sea using North Korean tankers, according to the report. The United States requested the UN sanctions committee to declare that North Korea had violated the UN-approved quota and “order an immediate halt to all transfers of refined petroleum products” to North Korea. The committee was expected to take five days to consider the request, which China and Russia are expected to block. Separately, North Korean officials did not show up at planned talks with the US on Thursday to discuss repatriating the remains of American soldiers killed during the 1950-53 Korean War. Returning the remains was part of the deal signed by Kim and Trump in Singapore. Pompeo had said a Pentagon team would meet with the North’s officials on or around Thursday at the inter-Korea border to discuss the repatriation. State Department spokeswoman Heather Nauert said the North Koreans called around midday to say the meeting would be delayed until July 15. “We will be ready,” Nauert said. Defence officials have already shipped dozens of cases to Panmunjom in anticipation of receiving the remains of US troops. The Pentagon says Pyongyang has indicated several times they have as many as 200 sets of remains that could be those of US soldiers who died in the war. But Pentagon officials cautioned it is unclear just how much North Korea is preparing to hand over. On June 20, Trump erroneously said 200 human remains had already “been sent back” from North Korea.